Apple has released Safari version 4 beta for both Mac and Windows. I gave it a try today and I’m giving my impressions on some of the new features. One obvious change is the moving of the tabs to the top of the browser window instead of having it beneath the bookmarks bar. Kind of disorienting at first but I’m slowly getting used to it. The currently used or active tab will have a lighter shade of gray as compared to the non-active tabs. If you have 2 to 6 tabs open, they’ll all have the same width. But once you have 7 or more tabs in the tab bar, the tab currently being used will be wider than the other tabs. Each tab has on its left-hand side an X inside a box, clicking it closes the tab. On the right-hand portion is a triangle (called the ‘handle’) which lets you to drag the tab to a new location on the tab bar or drag it out of the tab bar to create a new window. I’m finding this a tad annoying as I have to focus my pointer one small area of that tab as compared to just clicking on any part of the tab to move or drag it. Then again, the handle does let me drag an open window with no other tabs open and move it the tab bar of another window, something I couldn’t do in Safari 3. When it comes to opening new tabs, aside from the keyboard shortcut Command-T, in Safari 3 you can open a new tab by clicking on the empty space beside the right-most tab. This is an undocumented feature. This works as long as you only have about 10 tabs open. But once a window has more than 15 tabs (which I tend to have often), that empty space becomes inaccessible. 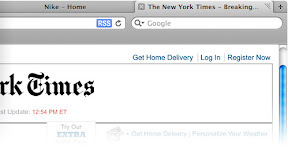 In Safari 4, Opening a new tab is as easy as clicking on the “+” button rightmost side of the tab bar. Very convenient. One thing I’ve noticed is that I sometimes need to click on inactive tab twice or thrice to activate it. Not sure if it’s my mouse acting up or some bug in the beta. 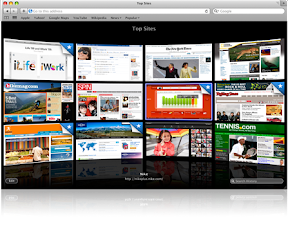 Also new to Safari 4 is Top Sites, a visual representation of your most visited sites. This idea is nothing new. Google Chrome and a Firefox plugin has had this before Safari 4. Apple has made it look better and more useful though. By default, Top Sites shows thumbnails of your most visited websites, arranged in a 4 x 4 grid in a pseudo-3D interface. You can adjust the size of the thumbnails by choosing Large (6 thumbnails), Medium (16 thumbnails), or Small (24 thumbnails). The thumbnails can be rearranged by clicking on the Edit button found at the lower left corner of the screen. You can tack a website to one specific location on the grid by ‘pinning’ it to that location. When a favorite website has been updated, a star will appear on the upper right-hand corner of the thumbnail. You can set every new tab or new window to open Top Sites in Preferences > General. Sometimes, when reading a long article or blog post, I’l use the Zoom In option in Safari 3 to enlarge the text so that I can sit back on my chair and read. But this would often result to messing the webpage up with sentences overlapping images and putting things where they shouldn’t be. The Full-Page Zoom feature lets you zoom in or out of the page, making the font size bigger or smaller while scaling images and graphics, preserving the layout of the page. Full-Page Zoom tend to accentuate some of the low-quality images on a website. Full-Page Zoom didn’t work while I’m writing this post on WordPress. You can turn on the Zoom Text Only option under View in the menu bar. One more cool thing about Safari 4 beta is the use of Cover Flow when viewing bookmarks as well as history. Very nice eye candy and very useful. One issue I’m having is not because of Safari itself but with my Logitech VX Revolution’s scroll-whell ratchet mechanism which causes me to skip items on Cover Flow for every roll of the wheel. Not a problem for most users though. Other features include smart address field, smart search field, and phishing and malware protection. There are two other changes I forgot to mention. First, the refresh button has been moved into the URL address field. Second, the blue progress bar which indicates that a webpage is still loading has been changed into a spinning wheel which overlays the refresh button inside the URL address field. I’m still getting used to the relocation of the refresh button. I find the Full-Page Zoom feature to be impractical when using a 15-inch, standard aspect ratio (4:3) monitor. The webpage becomes too large for the screen when I zoom in and I have to use the horizontal scroll bar to view the right side of an article. It would be a good idea to use the Zoom Text Only option. One annoyance with Safari is when it comes to zooming in/out or increasing/decreasing font size. Ctrl-scroll wheel down results to zooming in or an increase in the font size while ctrl-scroll wheel up is zoom out or a decrease in the font size. But for Firefox, Google Chrome, and IE, the exact opposite holds true: ctrl-scroll wheel up for increasing font size and ctrl-scroll wheel down for decreasing font size. Apple is going against the grain on this one and their approach is counter-intuitive. Doesn’t it make more sense for scrolling up to zoom in and scrolling down to zoom out? I think I’m noticing some spiffiness but not that much. Safari 4 also adds HTML 5 media and offline support, CSS effects, CSS canvas, Acid 3 compliance and Speculative Loading. CNET’s own tests show Safari 4 to be 42 times faster than IE7, 6 times faster than IE8, 3.5 times faster than Firefox and 1.2 times faster than Google Chrome. Check out the graphs and read more here. AppleInsider looks into the UI changes and how that ties into the Snow Leopard. Get to know more about all the features, old and new, at Safari 4 beta’s feature page. Good read. Some screenshots would have been nice.